An article in the guardian.com by Helen Davidson at Madjedbebe and Calla Wahlquist - Australian dig finds evidence of Aboriginal habitation up to 80,000 years ago - reports on a groundbreaking archaeological discovery in Australia's north. Artefacts in Kakadu national park have been dated between 65,000 and 80,000 years old, extending likely occupation of this region of northern Australia by thousands of years. Madjedbebe site custodian May Nango and excavation leader Chris Clarkson in the pit. Image: Dominic O'Brien/Gundjeihmi Aboriginal Corporation. 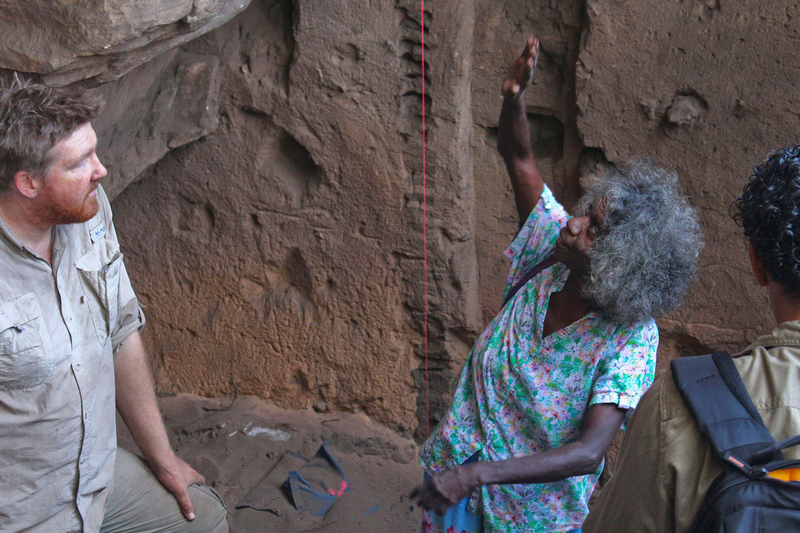 Lead author, Associate Prof Chris Clarkson, from the University of Queensland, states that some 11,000 artefacts from Kakadu national park prove Indigenous people have been in Australia for far longer than previously thought. Published recently in the journal Nature, the research asserts that some of the artefacts were potentially as old as 80,000 years. He believes it also means the time of overlap with the megafauna, for instance, is much longer than originally thought, perhaps as much as 20,000 or 25,000 years. It puts to rest the idea that Aboriginal people wiped out the megafauna very quickly. 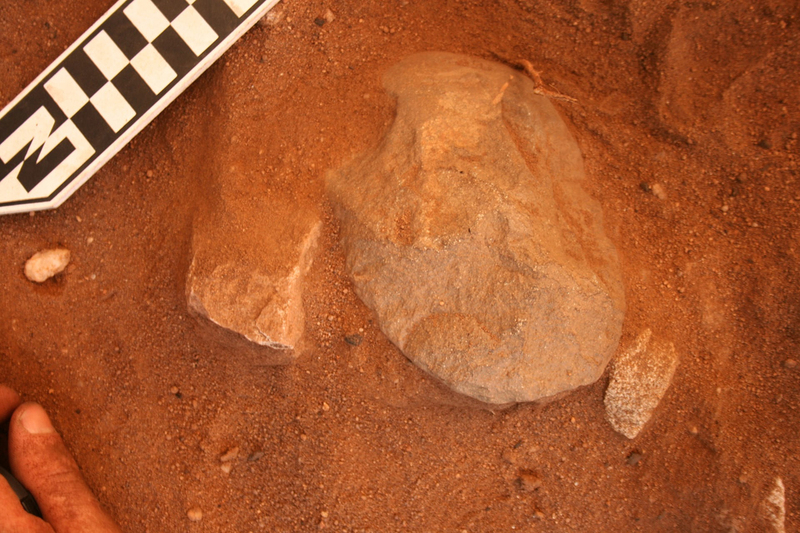 The artefacts were discovered in the Madjedbebe rock shelter. The shelter has been excavated four times since the 1970's, but the most recent processes used to date the artefacts meant the team could state directly that the area was occupied 65,000 years ago. The artefacts were buried in 2.6 metres of sand and sediment on the western edge of the Arnhem Land plateau. The site at Madjedbebe is on the traditional lands of the Mirarr people, but currently within the confines of the Jabiluka uranium mining lease, and surrounded by the 20,000 hectares of the heritage-listed Kakadu. 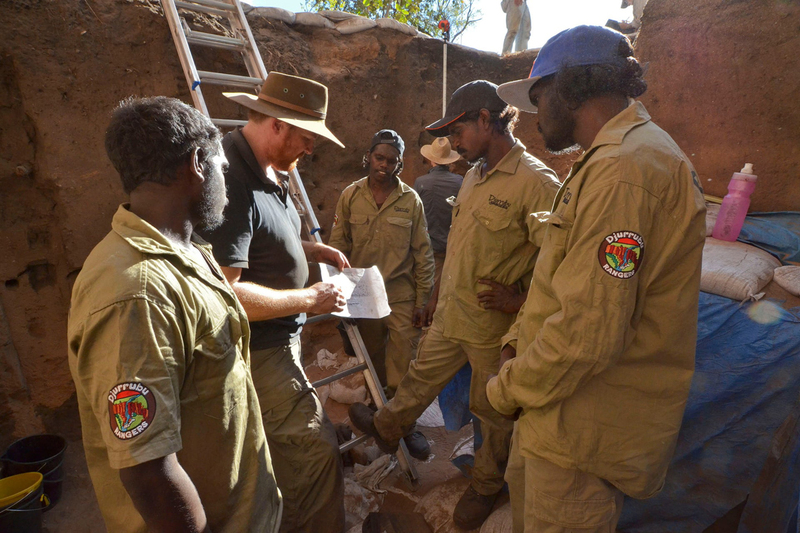 The Mirarr retained total control over the dig and the artefacts during this 5 year project. Edge-ground hatchet head being excavated. Image: Chris Clarkson/Gundjeihmi Aboriginal Corporation. More than 10,000 artefacts were uncovered in the zone of first occupation, including ochre and reflective paint substances, as well as the oldest unbroken ground-edge stone axes in the world - by about 20,000 years - and the oldest known seed-grinding tools in Australia. Professor Richard Fullagar from the University of Wollongong states that there were significant consistencies in the discovered technologies, throughout the timeframe. There were both strong similarities as well as remarkable changes. Clarkson and traditional owner Nango at the dig. Image: Glenn Campbell. In the deepest levels of sediment, some artefacts were estimated to be about 80,000 years old, or at least 95% likely to be older than 70,000 years. Artefacts were both carbon dated and dated using optically stimulated luminescence, a technique that measures the radiative signature of a grain of sand to measure when it was last exposed to sunlight. That dating method meant samples had to be extracted in complete darkness under red lights. Dates were confirmed by researchers at the University of Adelaide, who tested a blind sample, and at New Zealand's Waikato University. Clarkson standing in front of the 2015 excavation area with local Djurrubu Aboriginal rangers Vernon Hardy, Mitchum Nango, Jacob Baird, and Claude Hardy. Image: Dominic O'Brien/Gundjeihmi Aboriginal Corporation. 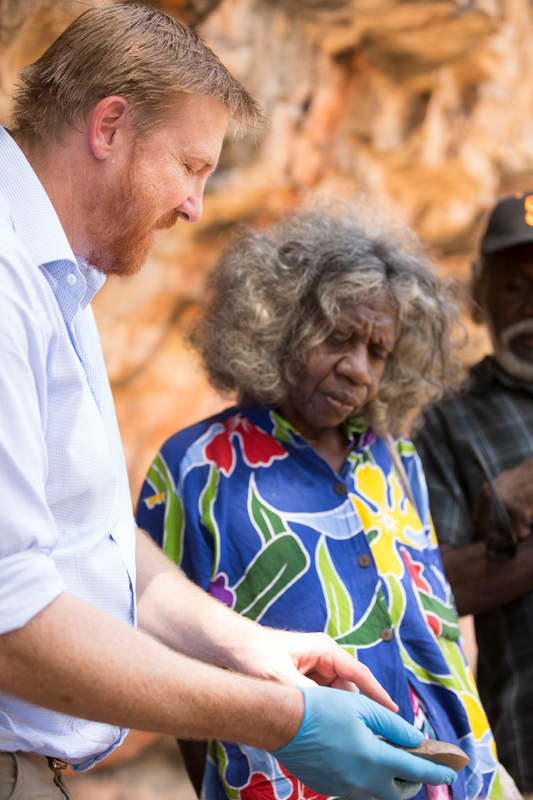 The site has been excavated twice by Clarkson's team, under a special agreement with the Gundjeihmi Aboriginal Corporation, in partnership with the current leaseholders, Energy Resources of Australia. Based on this agreement, researchers are now systematically surveying the surrounding area to find additional sites, to see if even older evidence of occupation can be found.